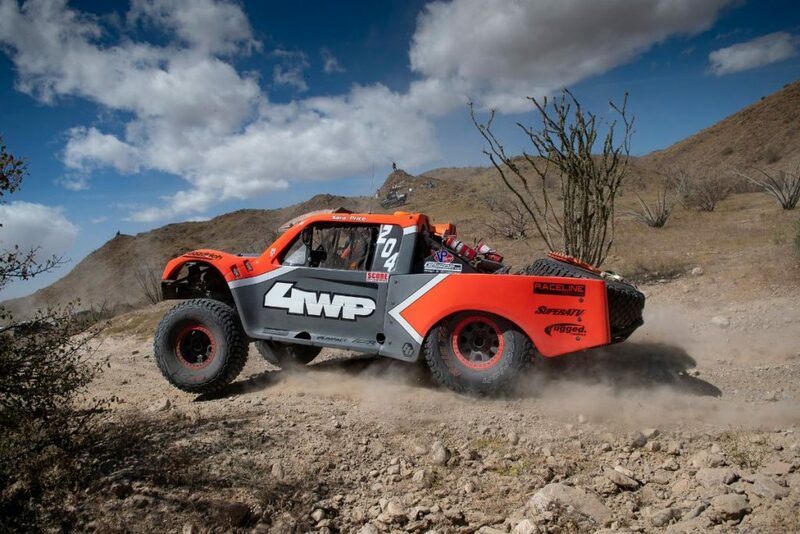 LAKE ELSINORE, California (April 10, 2019) – 4 Wheel Parts driver Sara Price claimed her first ever podium finish at the toughest SCORE International San Felipe 250 to date. The 33rd edition was, for the first time in history, a grueling 349 miles; the Trophy Truck Spec. class was stacked with a total of 29 vehicles taking the green flag. Fifth off the start, Price ran a consistent and smart race working her way up to 2nd by mile 30, And never looked back crossing the finish line in 6 hours and 54 Minutes placing the #204 only a few minutes behind the winner. The SP Motorsports owner is looking forward to the 3 more races of the championship. Her next stop will be at the Baja 500 in the early month of June. 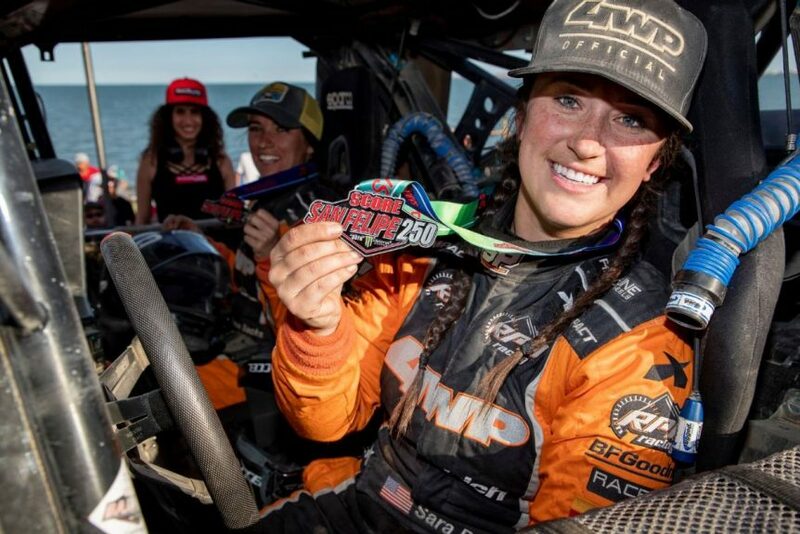 Waypoint Nav School Navigator Erica Sacks kicked off the SCORE season with Price for round 1 of four-race 2019 SCORE World Desert Championship. The duo came early to pre-run the course aboard SP’s Super ATV Polaris RZR Turbo S.
‘’This was one of the roughest courses I’ve ever raced in, but we put in the work and made it happen. An electrical issue left us without a GPS for 60 miles, Sara drove what she could see and we tried remembering what we could section-by-section while keeping up a fast pace.” said Sacks. The popular ‘’Spring Break’’ season-opener was held in San Felipe, the peaceful fishing village on the Sea of Cortez in Baja California, Mexico, 125 miles south of the U .S. borderat Calexico, CA. For the third straight year and the third time in history, the race started and finished on the Malecon beach walk along the edge of the water in the heart of town. Over 255 vehicles were expected to take the green flag Saturday morning. RPM Offroad scored an historic win in 2017 at the 50th anniversary Baja 1000 with Mexican driver Carlos “Apdaly” Lopez. He also won the SCORE International Trophy Truck championship in 2015 and 2016. 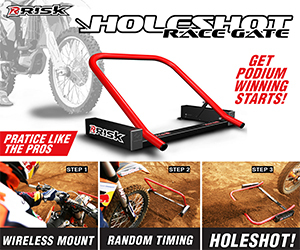 The team earned their first Baja 1000 Class 1 victory in 2014. Sara Price is Supported By: 4 Wheel Parts, RPM Racing, BFGoodrich Tires, Raceline Wheels, Rugged Radios, Super ATV, Baja Designs, Hoonigan Industries, VP Fuels, Polaris RZR, DRX Wear, Impact Racing.